This is what Kiteboarding is all about right? 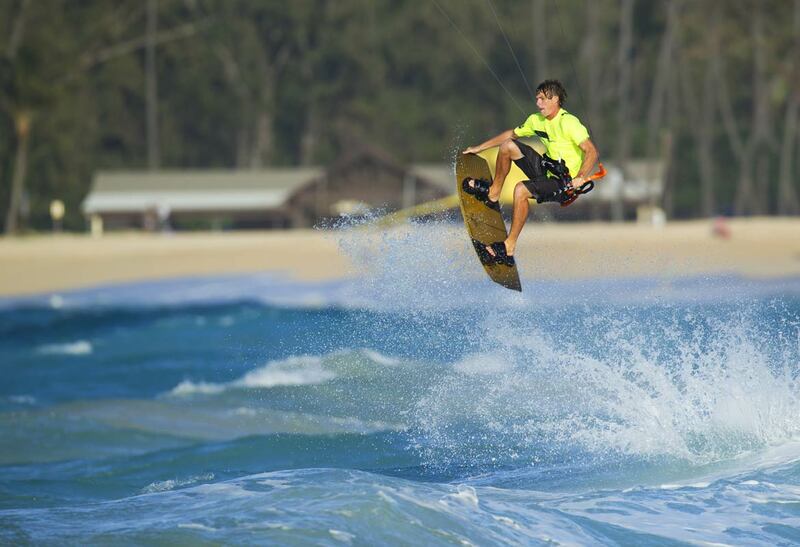 Its the main reason you got into Kiteboarding. You can jump that high with a kite! But a little intimidating? Follow these 4 keys steps to hit the skies with control and style! What makes you jump, really? Well, its the energy you generate while riding, building resistance against your board and kite allows you to catch serious air-time. With speed and real resistance built up in the kite you can boost big, but fall behind with your technique on either of these points and your jumps will lack their full potential. A good start is to increase and build board speed while maintaining maximum control, as we learn we often get over exited about jumping and cheat by using the kites lift. Not us, we’ll start from the basics! Build yourself a solid progression foundation. Riding fast, spot an area to take off approximately 4meters in front of you. Use the water conditions to your advantage and trip to jump off of bits of chop or waves. Keep the kite parked at 45 degrees for now and try to “chop hop” push off the water using your board and bunny hop as high as possible. Remember, we are building that important muscle memory on both sides so do it equally to the left and right. There is a distinct difference between the “pop” and “chop hop” so you can relate to the popping article for further information. Think of the Kite completing 3 simple steps as you learn to jump. 1. Initiating the turn of the kite 2. Powering up and flying 3. Redirecting and landing. You can bring this back to the basics of the clock face of the wind window. For now (if traveling starboard, right) we’ll park the kite at 3 o’clock. Send the kite to 12 o’clock while sheeting in (powering up, pulling on the bar). As we hit the apex of the jump and feel ourselves coming down we “redirect” the kite in our direction of travel to land. Taking the kite from 12 to 2o’clock with maximum control. Now, if you complete these 3 simple steps while riding in moderate conditions with moderate board speed you will take off into a nice, small jump! The next step is timing the Kite ripping you off the water and pushing off the water. To enhance your jump. Its common for the rider to send the kite to 12o’clock with pure excitement and joy of first flight but remember, if you don’t actively fly your kite throughout the jump you will just pendulum under the kite resulting in a kite falling from the sky quacking behind you after you plop in the water. By all means, look around and enjoy the thrill but try to maintain kite control, look at the way the kite flies as you are in the air and consciously think about learning to acknowledge when the apex of the jump is, as you start to descend and re-direct your kite to soften your landing. Early redirecting can result in a heavy and fast landing with a fair bit of impact, so as you pull on your front hand go easy and imagining yourself landing and planning away with speed. Once you release off the water just as your kite hits 12o’clock the wowza moment kicks in, you nailed the timing! You’ll feel when you got the timing just right, so think about pushing off the water just as you hold your final as last bit of energy and weight down through your board. As you progress you can be more aggressive with your boards “popping” motion and swinging of the kite through the wind-window which will enhance your height and hang time. Remember, stay clear of others down wind of you and build up. You can then work on tucking your knees in, tensing your core muscles and maybe even throwing in a cheeky board grab!